Please do not share this outside of the forums as its from my book. Ok will sort out tonight. I sure I copied that from the product specs. That’s for watching out for my errors. Corrected and will be visable in the next preview. 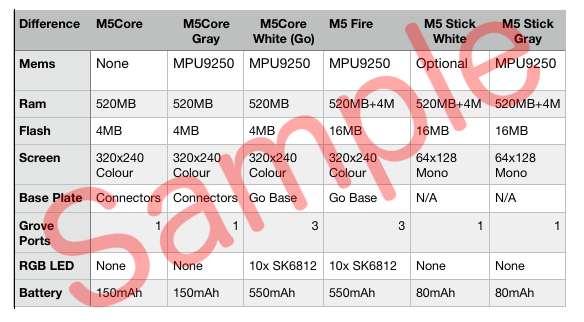 Hey, here's the comparison with m5core and m5stick. There is an error in that chart. The core has a battery. Basic and Gray do not own battery but battery socket inside. @watson There is a battery in the base plate or I have a high capacity capacitor. @watson the M5Core Basic has a 150mAh battery in it.